Our top download of all time has been the SID-Refresh tool for SAP ABAP Post-copy Automation (PCA), replacing the need for SAP Landscape Virtualization Manager (SAP LVM), a chargeable tool from SAP. As of February 2017, we have superseded this Windows-only version with a Java version for all SAP platforms on Windows/Linux/Unix. It is offered as a subscription service included FREE in our monitoring, or for separate purchase. If interested, please Submit an Inquiry or visit the SID-Refresh Solution Page for further details on cost, and user guide. Manual Data Copy from production server to QA server represents huge challenges. Data refresh is a necessary process to transfer data from production systems to non-production servers such as Development, Quality, Training and Testing for variety of reasons such as, process improvement and QA. Almost routinely, developments and upgrades are tested before they are released. Time constraint expresses itself in multiple ways. The actual time taken to refresh the non-production servers is high if post-refresh tasks are done manually. Production/QA system downtime happens as a consequence of data transport operations hampering business critical activities. System downtime is significantly high when Production data is large. System downtime leads to unnecessary project delays. When new business processes and testing of these processes is critical to meet Release dates, regular downtime and delays can be avoided by deploying efficient System Copy tools. Another time constraint is the coordination of multi-client environment, between users at different locations with different schedules, to align the refresh process. This effort is critical, since it is found that during the long and tedious data refresh process the production system’s resources are fully utilized. This, in turn, impacts the performance and the stability of the production system. There are available tools like SAP’s TDMS which has several benefits, but also has some added overheads – additional hardware requirements, complex installation and cost! Platforms and DBMS of a business suite is the same for non-production and production system - so this is used by majority of installations. The production system contains both ‘business data’ and ‘technical data’ (i.e. configuration). So the challenge of this solution is to ensure that after the system refresh, the quality system still contain pre-refresh information to ensure that it is fully functional (e.g. RFC configuration, transport systems) and does not create any integrity issue. Only quality (and unlocked) users can login to the quality system. No testing data is send other production system. For example, refreshed ECC system does not send data to ‘connected’ production BW/SCM system due to RFC configuration still pointing to production. Additional hardware is not required. The result is a quality system with the production system’s ‘business data’ and the original ‘technical data and configuration’ of the quality system. As already mentioned, the program does not require additional hardware, there is no complex installation and configuration. SAP Basis teams have provided us feedback over the last year which has led to this multi-platform version, one step closer to SAP Basis Automation of the common SAP system copy process. Through our learning, we've prepared a series of usage videos, solution documentation. Below is an FAQ list of ‘technical data and configuration’ that may be exported/imported using SID-Refresh. Note that selected options are saved on initial use, and can be reused on subsequent execution of the refresh. 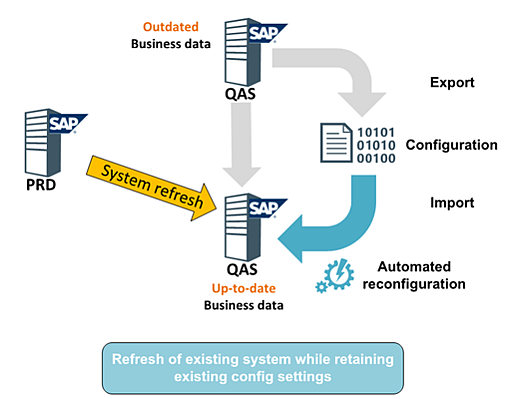 What SAP ABAP Systems can SID-Refresh support? JOBs (T-Code SM37): Is it necessary to deschedule jobs on source or target using T-Code SE38 → BTCTRNS1 before or after DB refresh? RFC Destinations (T-Code SM59): Do they need to be recreated or manually maintained in Target after DB refresh? Users (T-Code SU01, SU10): Is it necessary to run SU10 to block all non-system users? SAP LICENSE (T-Code SLICENSE): is manual re-installation of license files required? System Check (T-Code SICK): Does it need to be run after DB refresh? Change system settings(T-Code SE03): Is it necessary to manually “Set System Change Option" after DB Refresh? CTS (Customization & Transport System) settings(T-Code STMS): Is manual re-adjustments of Transport Management System needed? SAP System Profile (T-Code RZ10): Is it necessary to manually maintain or reimport/activate Start and Instance profiles after DB Refresh? CCMS Operation Modes (T-Code RZ13): Is it necessary to manually maintain or adjust Opmodes after DB Refresh? Printer Definitions (T-Code SPAD): Is it necessary to manually maintain SAP printers after DB Refresh? CCMS Logon Load Balancing Groups (T-Code SMLG): Is it necessary to manually delete SOURCE logon groups and create TARGET logon goups after DB Refresh? CCMS RFC Processing Groups (T-Code RZ12): Is it necessary to manually delete SOURCE RFC processing groups and create TARGET RFC processing groups after DB Refresh? DBA Schedules (T-Code DB13): Is it necessary to manually maintain SAP DBA Schedules after DB Refresh? Database Connections & Settings (T-Code DB02): Is it necessary to manually maintain SAP DB Administration settings after DB Refresh? SAP Mail Server Settings (TCode SCOT): Is it necessary to manually maintain SAP SMTP Server Settings after DB Refresh ? SAP EarlyWatch Settings (T-Code SDCCN): Is it necessary to manually maintain EWA (EarlyWatch) service connections and verification jobs after DB Refresh? Delete Old Spool Requests (T-Code SPAD): Is it necessary to delete old spool request after DB Refresh? Clean Old CCMS Statistics DATA (T-Code ST03N): Is it necessary to delete old CCMS stats after DB Refresh? BW-Only (Report RS_BW_POST_MIGR): Is it necessary to execute SAP BW cleanup after DB Refresh? Customer-specified Config Tables: Can custom tables be added to the list for export/import? Yes, SID-Refresh v1.3. This is for expert, customer understands and takes responsibilities for tables they specified.